Anchoring the University of Virginia’s offensive line from 1982-’85, the 6-5, 300 lb. Dombrowski finished his brilliant college career as UVa’s first-ever unanimous All-American. A two-time winner of the Jacobs Blocking Trophy (recognizing the ACC’s best blocker) and three-time First Team All-ACC selection, Dombrowski was equally impressive in the classroom earning First Team Academic All-Conference honors in 1985. 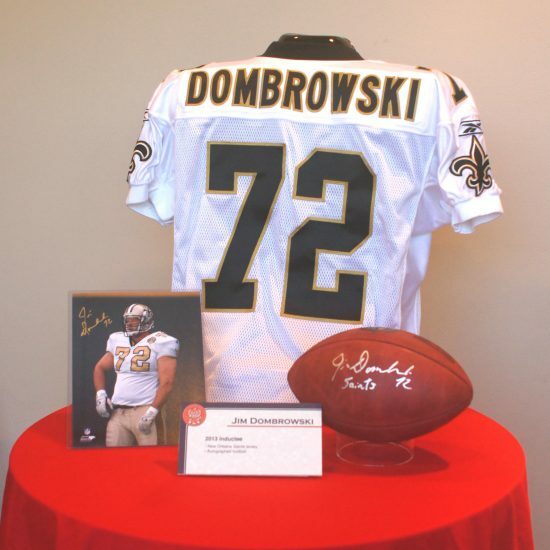 The New Orleans Saints chose Dombrowski sixth overall in the 1986 NFL Draft. He spent 11 seasons with the Saints and was named to the franchise’s 30th, 35th, 40th, and 45th Anniversary Teams. He was inducted into the Saints Hall of Fame in 2003 and the College Football Hall of Fame in 2008. Jim Dombrowski – Real Polish Power! If things had worked out a little differently, Jim Dombrowski might have developed into a great hockey player with the Buffalo Sabres or Montreal Canadiens. Instead, he went on to have a great career as an offensive lineman with the University of Virginia and the NFL New Orleans Saints. Jim is remembered not only for his considerable athletic ability, but also for his great intelligence and leadership. Jim was born on October 19, 1963 in Williamsville, NY, a suburb of Buffalo. He was the youngest of four siblings. Jim’s father, of course, was Polish and his mother was of German ancestry, with the maiden name of Schmitt. “My dad had to threaten his mother with never seeing her grandchildren if she did not accept my Mom,” said Jim. “My grandmother could not understand why my Dad couldn’t find a good Polish girl to marry! Jim’s first love in sports was hockey, “or how they refer to it down in Louisiana, ICE hockey,” said Jim. Boston Bruin Bobby Orr, Buffalo Sabre Gilbert Perrault, and Montreal Canadien Maurice Richard, were among his favorite players. He particularly liked watching the great Montreal Canadien teams of that era compete against the hometown Sabres. “Awesome hockey to watch!” he remembered. In his youth Jim spent a lot of time playing hockey. “I was fortunate enough to play on a good team and my season was 10 months long with about 85 -100 games per year,” he said. “That took up most of my time, but I still found time to play baseball competitively.” He also played some tennis and golf, saying “generally anything with a ball was fair game.” However, he never played basketball. “If I did I would have fouled out in the first few minutes of the game as contact is not allowed,” laughed Jim. But, as Jim’s size and strength increased, his passion turned to football. 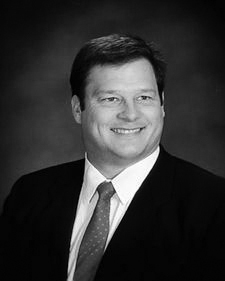 Dombrowski, who grew to 6-5 and played in the NFL at 330-lb, performed on offense, defense and special teams for the Williamsville South football team from 1978 to 1982. His honors included Defensive MVP in the Lions All-Star Game and First Team All-Western New York. He was selected all-ECIC, all-WNY, and named to the Adidas All-American and the Centarian All-America football teams. His football jersey (#77) was the first jersey ever retired at the school. Jim earned a scholarship to the University of Virginia where he went on to become one of the top student-athletes in the history of Virginia athletics. There, he received the NCAA Today’s Top Six Award for his combined athletic ability, academic achievement, leadership characteristics and campus involvement. He was also a unanimous First Team All-America football selection in 1984, the school’s first-ever unanimous All-America choice. He was a three-time First Team All-ACC player for the Cavaliers. He also was the two time-winner of the Jacobs Blocking Trophy as the ACC’s best offensive lineman. His work in the classroom was just as impressive as his efforts on the field, as he earned First Team Academic All-Conference honors in 1985. The university retired his #73 for his outstanding contributions. Dombrowski left the Virginia football program in much better shape when he left. With George Welsh coaching and Jim anchoring the offensive line, the Cavaliers program was revived in the early 1980s. The Cavaliers’ ended years of futility by posting three consecutive winning seasons, and its first-ever bowl appearance, a win over Big Ten runner-up Purdue in the 1984 Peach Bowl. Jim was a first-round draft pick of the New Orleans Saints (the sixth overall pick) in the 1986 NFL draft. As with Virginia, Jim was an integral part revitalizing a struggling football program under head coach Jim Mora. He helped the Saints to a 12-3 record, earning their first-ever winning season and first post-season appearance. With his consistently excellent play and strong leadership, he anchored the Saints offensive line. The Saints’ first winning season would be followed by another six consecutive non-losing seasons. In all, Jim was part of four playoff teams in New Orleans as a starter, in 1987, 1990, 1991, and 1992. He started most of his 11 years (1986-1996) with the Saints, playing both guard and tackle. Dombrowski played left tackle until the middle of the 1989 season, and then played left guard until his retirement in 1996. During his eleven NFL seasons — all with the Saints —- he played in 151 regular season games and started 137 of them. In 1991, he received his Masters of Education and later pursued a career as a certified financial planner in Mandeville LA. He thought about going into coaching at the time, but he decided he wanted to spend more time at home with his young family. However, he has helped coach at Mandeville High School, where his sons played. 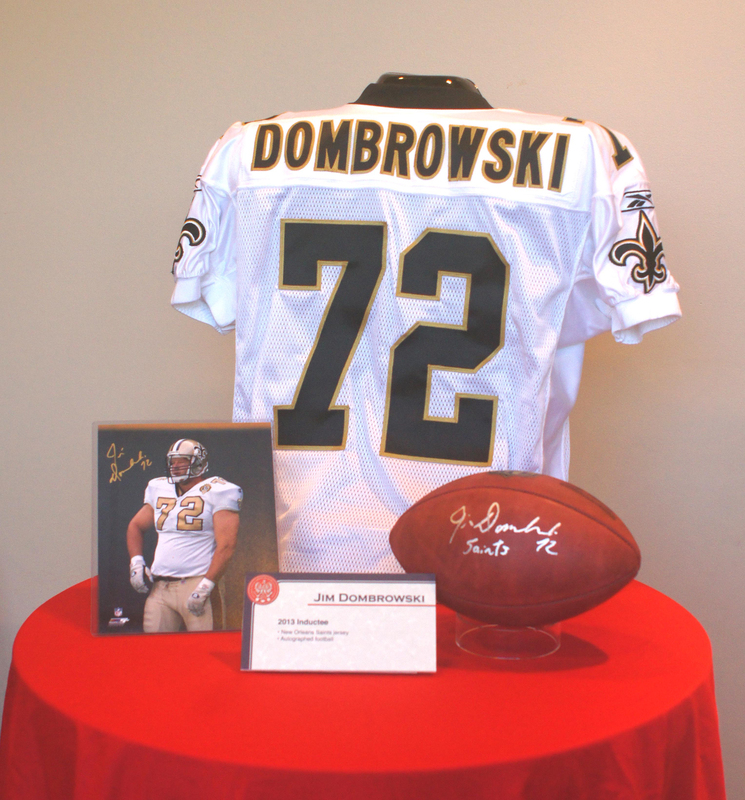 After his playing days were over, Dombrowski received numerous honors, including induction into the National Football Foundation College Hall of Fame, the Virginia Sports Hall of Fame, the Greater Buffalo Sports Hall of Fame and the New Orleans Saints Hall of Fame. He was also named to the Saints’ 30th and 35th anniversary teams.